Discus have been so extensively bred that they almost have an infinite array of patterns and color combinations. With so many stunning variations, both in the wild and in home aquariums, discus have won the hearts of many aquarists. Unfortunately, for beginners, discus fish care might be overwhelming, especially if they started out with hardy fish like goldfish or betta fish. That being said, this guide will help you care for your discus without consuming too much time and money, and without getting too deep into specialized aquarium equipments. When choosing a tank for your discus, you should always take into consideration both the adult and juvenile size of the fish. One juvenile discus per 5 gallons is preferable, but if you’re not planning to move them to bigger tanks as they grow, then you’ll have to take into consideration the fact that adults need twice the volume of water as the juveniles, which means that you’ll need 10 gallons per adult discus. Because discus are schooling fish, it’s a good idea to keep at least six or more of them. This means that the minimum recommended tank size is around 60 gallons, with 75 gallon tank being preferable. While it is preferable to keep discus with their own kind, it’s possible to keep other peaceful community fish with them to make the tank more lively. Discus, however, prefer a specific type of water – one that’s warm, soft, and acidic; this rules out livebearers, goldfish, oscars, and other common fish one might be thinking of adding. Discus are also quite timid and rather slow, so mixing them with boisterous fin nippers is a death sentence for them. Fish that are ‘too hardy’ can also carry strains of disease that the more delicate discus cannot handle. One of the most common misconceptions regarding discus fish care is that as with any other fish, adding a bottom dweller like kuhli loach or catfish balances out the sections of the tank while keeping the bottom of the tank clean. Unfortunately, however, discus fish care gets a bit more complicated; if bottom feeders are introduced into the tank, discus are no longer able to graze on the bottom due to them being rattled by the more active corydoras or loaches. As a beginner, you might want to stick to just keeping them with their own kind. Discus are tropical fish, which means that they do better in warmer water of 28-30°C. Take note that because discus prefer warmer water, this means that certain plants and fish that require cooler water are out of the equation. This includes plants and fish that have 28°C as their upper limit for temperature. Discus in the wild come from rivers, which, by nature, meanders. This means that as it meanders, the current is effectively slowed down. In aquariums, this means having a gentle stream of water. This is especially important for juvenile discus. For adults, they should be able to handle stronger currents. Feeding with the right kind of food is one of the most important aspects of discus fish care. Variety comes into mind, as feeding the same kind of food may deprive your discus of some of the nutrients they might be able to get better in other types of food. There are plenty of frozen food types, from the bloodworms to mysis. For flake and pellet type foods, there are plenty of ones formulated especially for discus. Quality frozen, pellet, and flake foods are preferable, as live food can act as parasite, bacteria, or virus carriers that can quickly compromise the health of your discus. Discus are as unique as they are paradoxical; they are quite sensitive to bacteria, viruses, and parasites, but as bottom grazers, they will scour the bottom of the tank for scraps of food, which are often havens for harmful bacteria and parasites that could end up killing them. 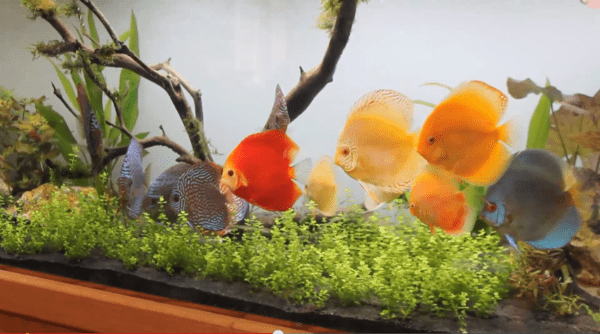 To minimize the chances of this happening, one could either have a bare bottom tank, or one could simply feed the discus several times a day with food that they can completely consume in up to 3 minutes max. The key to successful discus fish care isn’t necessarily top-notch aquarium equipments or gigantic aquariums. It is something so deceptively simple yet so difficult to perform consistently: consistent water changes. In the wild, lakes, seas, rivers, and oceans are able to dilute the waste of decaying matter with the massive volume of water they hold. In the home aquarium, however, these wastes quickly build up. Even with top-notch filter media, some wastes and byproducts remain, like growth stunting hormones produced by fish themselves, or nitrates, which require anaerobic bacteria, which is rather hard to achieve in aquariums. Nutrients that plants need are also steadily depleted. All of these problems are solved by performing regular water changes; at performing at least a 25-40% water change per week will keep your water clean and both your discus and plants happy. Discus Fish Care: Not Just for Experts Anymore! With the knowledge and technology we have today, discus can thrive even in the hands of the most inexperienced aquarist. By taking time to know about the specific requirements of discus, as well as the simple tips you can employ to keep them happy and healthy, you should have minimal problems in the long run. I encourage you to be patient and diligent, as what you’re taking care of are no longer simple goldfish you can keep with minimal effort, but unique, colorful, but often sensitive discus. What often kills discus isn’t a skipped water change or a skipped meal; it’s the buildup of bad aquarium husbandry of repeatedly skipped water changes and feedings. Discus fish care entails a whole lot of research, and sometimes, meticulous setups. Make sure that from the start, you do not skimp on quality equipment, water changes, and tank size. If you’re ready to combine this with proper aquarium husbandry, you’re all set to start your first discus tank!